Kollywood actor and politician JK Ritesh died on Saturday, due to cardiac arrest. After the sudden demise of actor-politician JK Ritesh, Kollywood celebrities took to Twitter and shard their condolences. 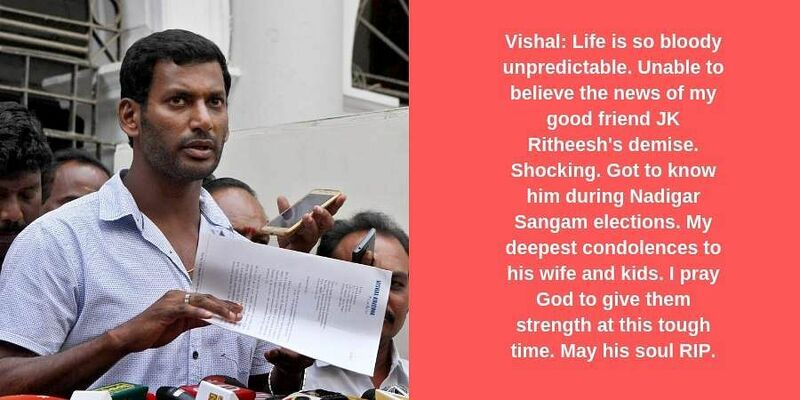 Vishal: Life is so bloody unpredictable. Unable to believe the news of my good friend JK Ritheesh's demise. Shocking. Got to know him during Nadigar Sangam elections. My deepest condolences to his wife and kids. I pray God to give them strength at this tough time. May his soul RIP. 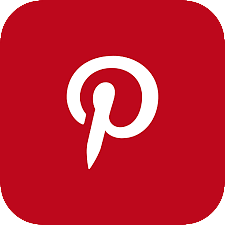 Varalaxmi Sarathkumar: One of the nicest human beings I’ve ever met. JK Ritheesh sudden deaths like this one is such a shock to the family. I hope they find strength. Let’s all take a min to mourn for him and may his soul rest in peace. God bless you wherever you are sir. U were an amazing soul. 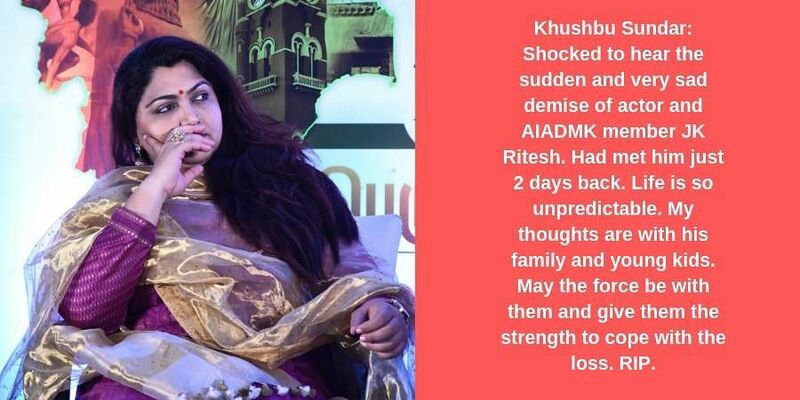 Khushbu Sundar: Shocked to hear the sudden and very sad demise of actor and AIADMK member JK Ritesh. Had met him just 2 days back. Life is so unpredictable. My thoughts are with his family and young kids. May the force be with them and give them the strength to cope with the loss. RIP. 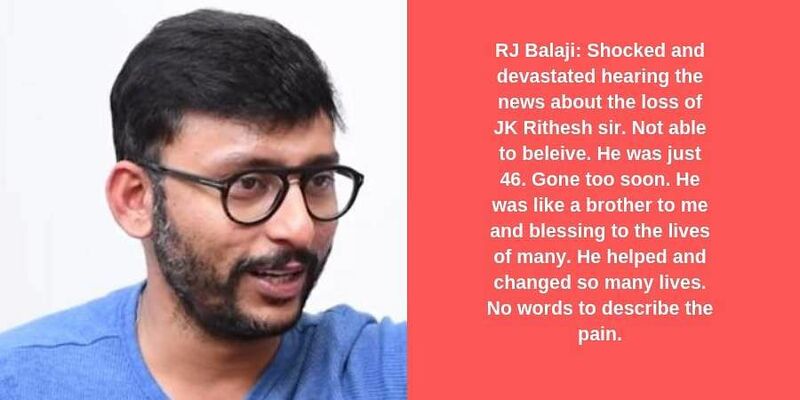 RJ Balaji: Shocked and devastated hearing the news about the loss of JK Rithesh sir. Not able to beleive. He was just 46. Gone too soon. He was like a brother to me and blessing to the lives of many. He helped and changed so many lives. No words to describe the pain. Venkat Prabhu: Really an awesome human being. Gone tooooo very soon saar. Really heartbroken. JK Ritheesh Rest In Peace. Our deepest condolences to the family. Vijay Vasanth: Shocking to hear about my dear brother JK Ritheesh passed away!! May his soul rest in peace! My deepest condolences to his family to his friends and to his followers!! Dhananjayan G: This is totally shocking. Cannot believe a sweet person like him going away so fast. 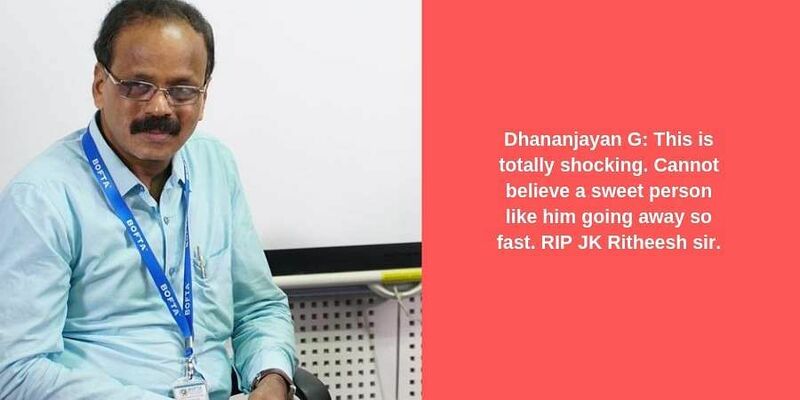 RIP JK Ritheesh sir.